My baby is 2.5 months old now and I just did my first official activity with him! 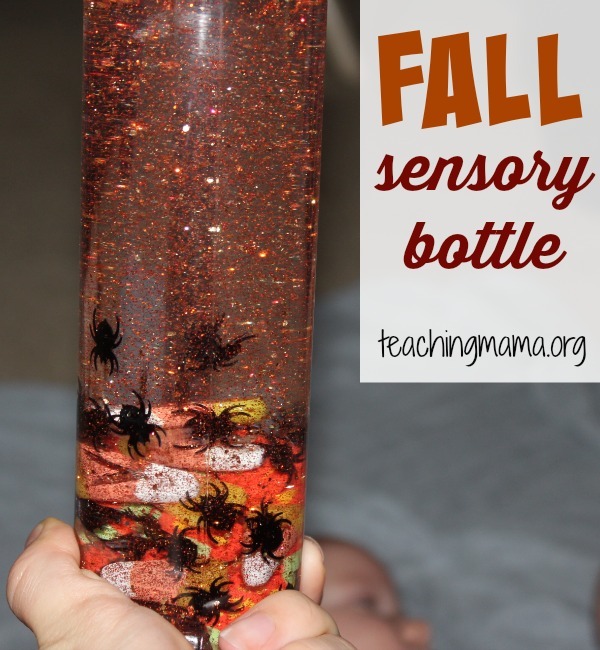 We made a fall sensory bottle for him to look at. Now it may seem silly to do an activity with an infant, but it was a great first sensory activity and I could tell that he really liked it! He kept staring at it and would follow it with his eyes. 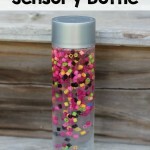 If you are new to sensory bottles, you may want to check out my post all about sensory bottles. 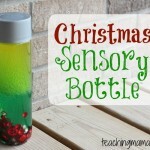 Sensory bottles are a great first baby activity! I had my preschooler make the bottle. 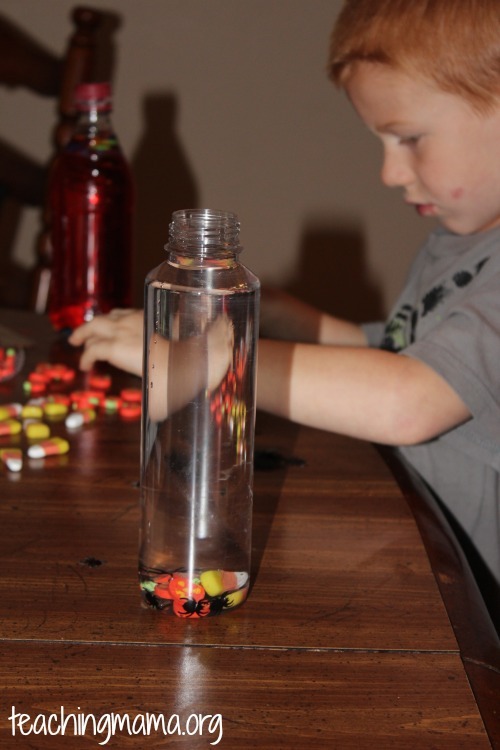 Making sensory bottles is one of his favorite things to do. 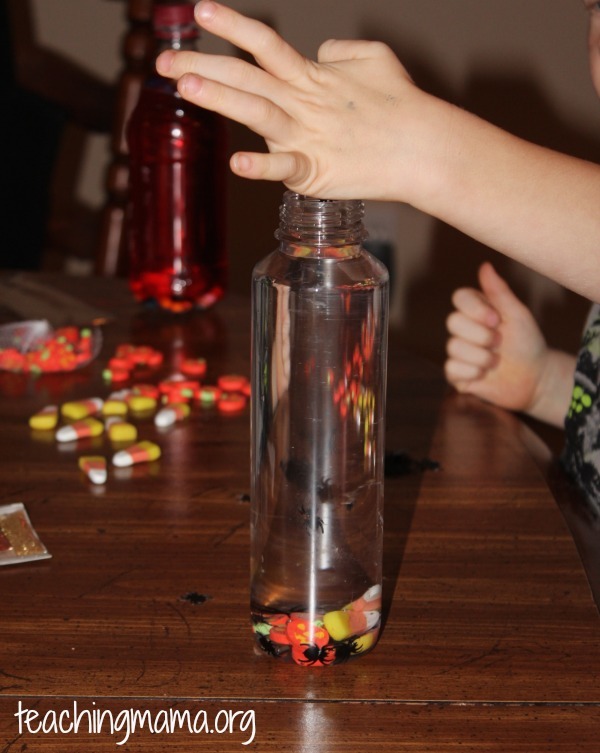 In fact, in the background of the next picture, you can see a red sensory bottle he made a month ago. He still plays with it! 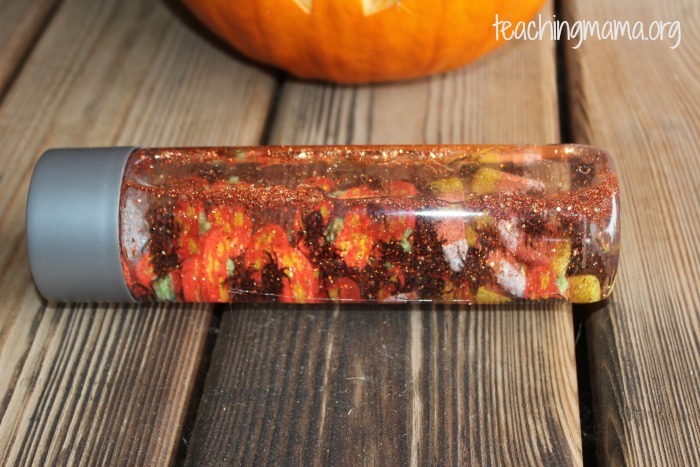 After he placed the materials in the bottle, I used a hot glue gun to seal the bottle. No one wants an accidental mess! 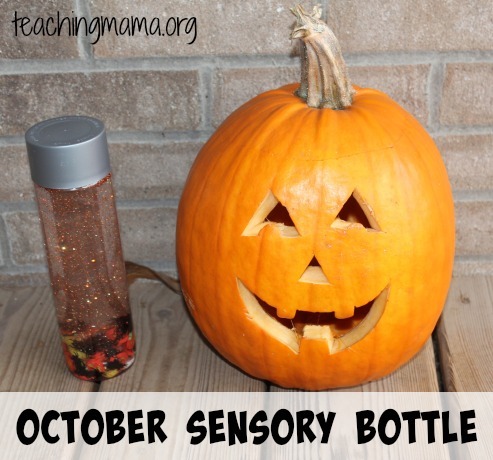 Here is our October sensory bottle! 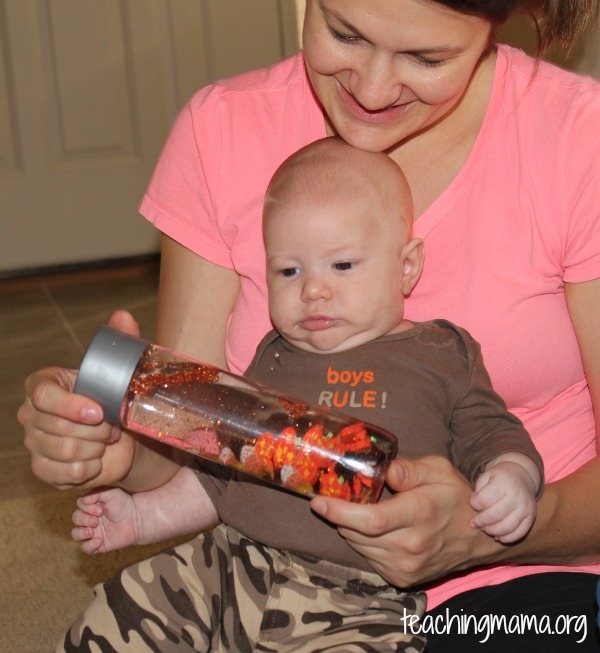 To introduce the sensory bottle to my baby, I placed him in my lap and moved the bottle back and forth. He just watched and didn’t want to take his eyes off of the bottle! If he was an older baby, I would let him shake the bottle himself. 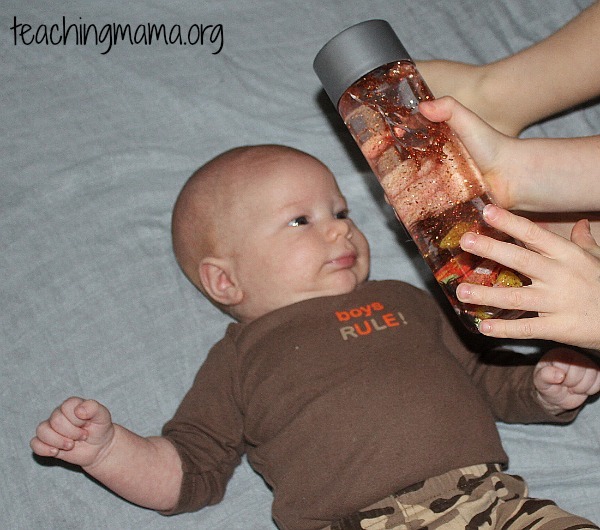 And big brother took a turn showing the sensory bottle to baby! 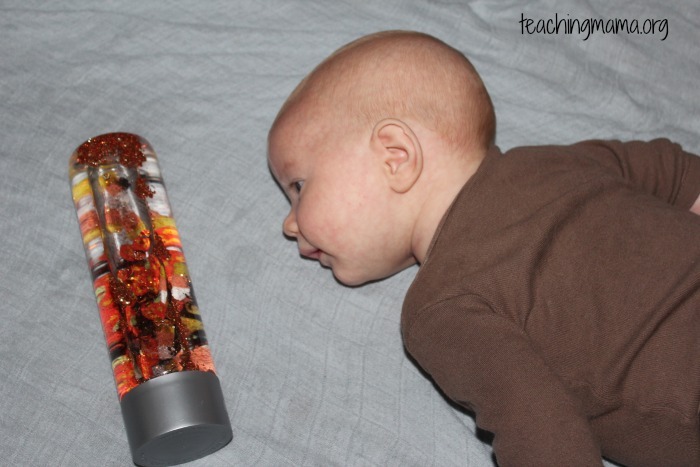 During tummy time, he enjoyed lifting his head up to look at the sensory bottle! He even started reaching for the bottle with his hands and even touched it a few times. I love seeing him discover how his hands work and watching him explore the world around him. I think my favorite material inside the bottle were the black spiders, because they would float around instead of just sinking to the bottom. 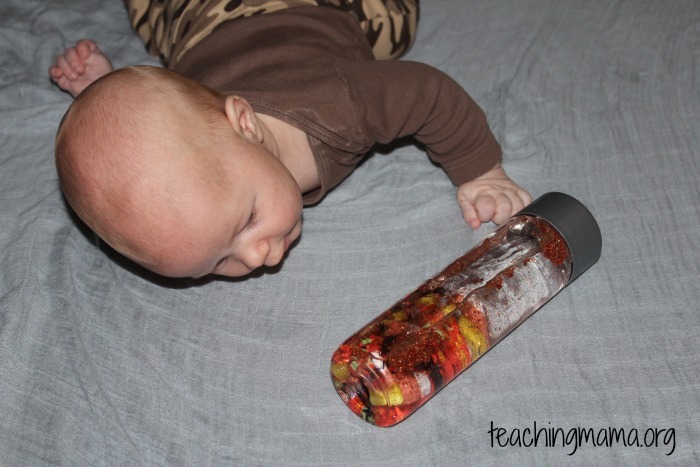 He really loved the sensory bottle! I can’t wait to make more for him. 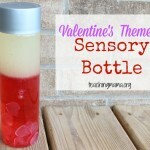 I’ve decided to create a new sensory bottle each month and share them with you in a series called 12 months of sensory bottles! 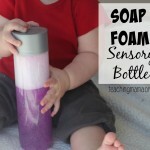 This is a great sensory activity for babies, but also toddlers and preschoolers! All of my kids like them and we have quite a few now! 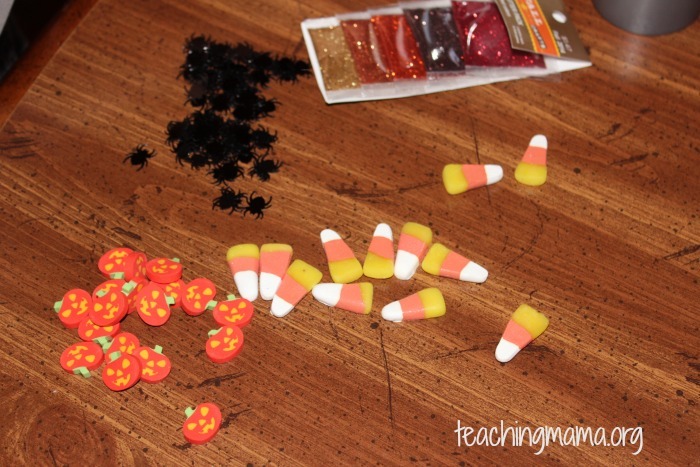 They love to shake them, roll them, and display them in their room. 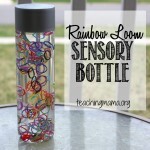 Do you make sensory bottles? Hi! Do you re-use the same plastic bottle every month or save the different bottles you make and rotate them at different times? Thank you! Is it just water inside with all the stuff? Or is it some sort of thicker liquid? 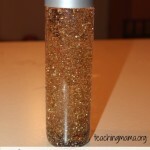 I tried to make one of these today but the glitter clumped up in the water. Do you not have this issue? I’m so sorry to hear this! Mine did not clump together. I’m wondering if it has to do with the consistency of the glitter. The kind I used was fine glitter. When you shake the bottle do the clumps go away?